Infrastructure and connectivity is going to have a huge impact on how the West of England delivers the new housing required to support economic development. A new report launched by Bristol property adviser GVA outlines how the electrification of the Great Western Mainline will be a key driver of economic growth, unlocking significant change and development. GVA’s report, “Great Western Electrification: Unlocking future growth” launched at a breakfast event in Bristol entitled Evolving Bristol, takes an indepth look at the opportunities being opened up by infrastructure investment and the importance it will play in the continued evolution of Bristol and the South West region. 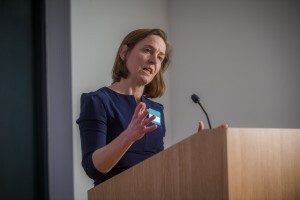 Jo Davis, Regional Senior Director at GVA talked about how infrastructure and connectivity is going to have a huge impact on how the city moves forward. Re-opened rural railway stations at places such as Saltford, Royal Wootton Bassett, Wilton and Corsham provide important opportunities to consider as locations for sustainable, long-term residential growth. Other locations that will be increasingly connected to the Great Western Mainline corridor through new stations or capacity improvements such as Portishead, Cirencester and Long Ashton would also support a mix of uses with new floorspace for businesses. GVA welcomed two guest speakers to the Evolving Bristol event, Mr Barra Mac Ruairi, Strategic Director of Place at Bristol City Council, and Dr Jo Michell, senior lecturer economics at UWE. This entry was posted in Uncategorized on March 8, 2017 by Penny Adair.